If there is one thing I can tell you about gluten free baking, it’s that if it works, keep doing it. A mantra I have stood by through and through, and the reason why I have posted 8 slightly different variations of cheesecakes – so far. Baking gluten free is not always as simple as just substituting regular flour for gluten free flour – I wish. The trick to being more successful in your baking is not trying to re-inventing the wheel every time, rather sticking to what you know. This Apple Spice Loaf is similar to this Apple Currant Bread I shared with you all a while ago. Using the same base recipe, I changed it up by adding some nutmeg and ground clove to give it more of a holiday taste, then added some pepitas for extra crunch, and showered the whole thing with confectioners sugar. Et voila! A new-ish recipe. Gluten-free baking, can be easy if you aren’t an adventurer. 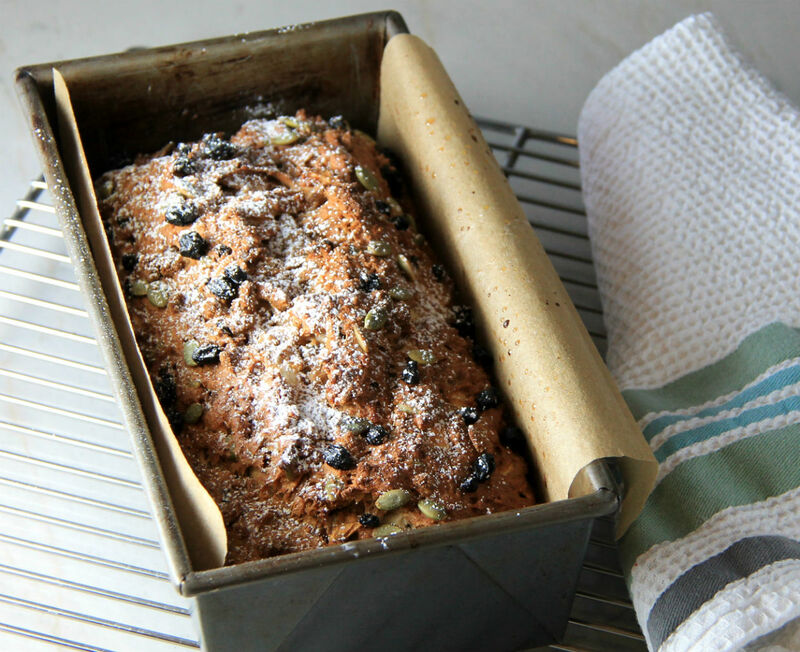 Line a 8 1/2 x 5 loaf pan with parchment paper and set aside. In a large bowl whisk together applesauce, sugar, butter, eggs and vanilla. In a medium size bowl add gf flour, baking soda, baking powder, spices and salt. Add flour mixture to bowl with applesauce mixture and combine well. Fold in apple and currants. Pour into prepared loaf pan and bake 50-60 minutes, or until toothpick inserted in center comes out clean. © 2018 Pamela's Gluten Free Recipes. All Rights Reserved.